When thinking about most conflicts, large or small, I find myself mentally organizing people’s responses to the conflict into particular rungs within this ladder (a personal model adapted from the work of the Arbinger Institute, Sustained Dialogue, and other sources)…. My side is good, righteous, brave, wise, noble, thoughtful, moral, rational, etc. The other side is cruel, evil, inhuman, immoral, irrational, ignorant, etc. and may be terrorists bent on the destruction of something I hold dear (literally in some situations, figuratively in others). I acknowledge that the other side may feel just as firmly about its beliefs on this issue as I do about my beliefs. I don’t agree with the other side’s view, but I realize that this view exists and that the other side disagrees with me for reasons that IT thinks are valid (even if I don’t think those reasons are valid). I acknowledge that while they and I may have some fundamental disagreements on the issue at hand, I do, in fact, have some things in common with the people on the other side and may even agree with them on some (possibly small) aspects of the issue. I believe that (at least most of) the people on the other side are good people, though I may disagree strongly with them. While I firmly maintain my own identity and my beliefs that my own views on the issue are correct, I acknowledge that people on the other side may have different views that may also be correct, even if those views seem to be in conflict. That there are legitimately pros to my side and cons to my opponents’ side does NOT imply that there are no pros to my opponents’ side nor does it imply that there are no cons to my side–my opponents may indeed be CORRECT about the pros to their side and the cons to my side. It is always valuable to be intentional about exploring for the good on the other side. “When you rise to the level of love, of its great beauty and power, you seek only to defeat evil systems. Individuals who happen to be caught up in that system, you love, but you seek to defeat the system.” — MLK, Jr. (11/17/57). “Darkness cannot drive out darkness, only light can do that. Hate cannot drive out hate, only love can do that.” — MLK, Jr. 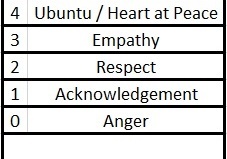 This ladder applies to conflicts on a wide spectrum of sizes: from small interpersonal disputes (with a neighbor, boss, family member, etc.) to major international conflicts and everything in between. Moving up this ladder is much easier said than done; moving up this ladder is much easier for conflicts you can see from afar. Regardless, it is important to move up this ladder. It may sometimes appear that gains can be made by your side by moving to lower levels of the ladder. It may indeed be correct that you can score short-term gains. However, every time you do this, you make it harder for yourself, others on your side, and (particularly) people on the other side to move up the ladder in the future. Personally moving up the ladder does not require others on your side to also move to higher levels of the ladder and does not require others on the other side to also move to higher levels of the ladder. In the short-term, it may be unlikely for anyone else to do so, but in the long run, the higher you move on the ladder, the more possible it is for others on all sides to also move up the ladder. Regardless of whether you initially care about the interests or lives of people on the other side, it is always in your own side’s (long term) self-interest to move higher up this ladder. Many people are at low levels on the ladder. The conflict may only be resolvable in the long-term by moving towards the top of the ladder. Most propaganda exists at level 0. In fact, a good test of whether you are sharing propaganda (on Facebook, for example), is if the item you are posting fits nicely at this level. Sharing level 0 propaganda may indeed be helpful in the short-term (see the bullet above about short-term gains). However, it is not in your side’s best interest in the long-term (let alone the best interest of everyone else) as it puts downward pressure on everyone– pushing them towards low rungs of the ladder. Adaptive Leadership is a powerful framework for thinking about how to empower people to move to levels 3 and 4 and how to push them to productively work to resolve the conflict once they are there. Rungs 0 and 1 refer to the other side as “it.” Rungs 2, 3, 4 refer to people on the other side as “they.” This is intentional. Most of this is written in terms of “my side” and “the other side.” In reality, in many conflicts there may be lots of sides (not just two). Moving higher up the ladder may help you see more of those sides. Think of some conflicts you are currently involved in or aware of. Think of some small scale interpersonal conflicts and think of some large scale political or international conflicts. For each conflict you thought of, at what level of the ladder is your current thinking? Do you want to move to a different level? Why or why not? This entry was posted in Convopointer, Leadership, Political thought and tagged Adaptive Leadership, Anatomy of Peace, conflict, empathy, mandela, MLK, Sustained Dialogue, Ubuntu. Bookmark the permalink. I find that it’s easy for me to be on the “higher”* rungs of your ladder for some kind of generic, abstract conflict or something like a petty conflict with a loved one. But the more important a specific philosophical/moral/political issue is to me, the less likely I am to be beyond your acknowledgement rung (at best). And I’m totally fine with that. *I don’t mean to be pejorative with the scare quotes; I used them very thoughtfully. That’s because I’m not yet convinced that the rungs as you describe them are inherently better or more useful the higher you go… which is why I don’t really care that for many important conflicts I can think of, I’m at your “lower” rungs for now. Hmmm. I believe that sometimes (Lizzy’s examples above?) the positions of the other party are genuinely unacceptable and indefensible. Surely it is the extreme of the spectrum of conflict, but I don’t really accept “pros” regarding positions such as “I will commit genocide,” or “As a serial killer, I will indiscriminately large numbers of innocent persons.” What I am willing to accept is the humanity of the person on the other side (not humanity as in “being humane,” but simply that they are human.) Their positions may have been born of anger, or fear, or hopelessness or mental illness, or some combination of these and other factors. Believing that humans can learn and grow and mend, I can hope for healing and reconciliation…but in some situations I simply could not grant that there were “pros” to an adversary’s positions and goals. Yeah, I agree. This is why I weakened that third rung from acknowledging the pros of the other side (which assumes they actually exist) to simply realizing that the fact that there are pros on my side doesn’t immediately imply there aren’t also pros to the other side. This doesn’t mean there necessarily are pros to the other side, just that you should acknowledge the possibility that there are, and that there is value in putting in a good faith effort to figuring out what they might be (whether or not you actually find any)…. Hi Zack, thanks for both of your thoughtful replies, and Laurie’s as well! I really do love this post; I think it applies to the overwhelming majority of cases we face today and I mostly put in my comment just to be devil’s advocate. Rung 3 was not bad before, but I like the changes you made to it even better. At least for me, it still prompts me to consider the other side’s perspective much more fully than I would otherwise, but allows for extreme cases to have an “out”. It’s really hard to make a perfect model, but this is excellent. Keep it up! 1. “Education Reformers” are absolutely correct that it doesn’t make sense for “bad” teachers to continue teaching without the ability of their administrators to get rid of them. Teachers unions are also absolutely correct that there is enormous value (to students, in addition to teachers) for teachers to have some protection from being fired for crazy or arbitrary reasons (their principal is mad at them because they spoke up about something, they happen to be LGBT, etc.). For people identifying with either of those sides, the fact that their “side” is indeed correct doesn’t automatically mean the other side is wrong. Acknowledging that people supporting the other side also happen to have valid concerns changes the issue from one of simply vilifying the other side–and seeing which side can yell louder about the other–into one where all involved can work together to improve the system overall (which, of course, may not actually be very easy, as the valid thinking of both sides seems to be in conflict). In the long run, there is HUGE benefit to everyone involved if more people acknowledge that there is at least some truth in the thinking of both sides. In both of these examples, opposing factions may certainly be mad at each other for the tactics each side has used to promote their cause, and may certainly think that the good their own side sees outweighs the good the opponent could see, however, there is huge value to each side individually (and everyone overall) to realizing that shouting that “there and huge pros to my opinion and huge cons to your opinion” DOESN’T imply that there are no pros to your side or no cons to my side! My reason for making that last part of the rung 3 pretty strong (“people on the other side are right to feel the way they feel and right to think the things they think”) comes from a fear that weakening it to only apply to some situations will open the door to everyone simply always assuming their opponent was on the “bad” side of that line and that they don’t have to seek the good in the other perspective. Keeping it worded strongly forces people to at least consider the good on both sides. However, in thinking more about this, most of my arguments for why this is important comes back to Paulo Freire’s thinking (echoed at least to some extent in the quotes in rung 4) that oppression leads to the objectification of those being oppressed but also to the objectification of the oppressors, and that working to break out of such a system “humanizes” the oppressed AND the oppressors (which I think also applies in conflicts in which it is not clear if either side is actually an oppressor). If MLK, Nelson Mandela, and Anne Frank can still see the good in their opponents (and the value to their own side in remembering the humanity of their opponents), then people in conflicts much less intense certainly can, too! That being said, much of this thinking falls into rung 2 (“I believe that at least most of the people on the other side are good people, though I may disagree strongly with them”) and run 4 (my humanity is tied to the humanity of everyone–including my opponents–and long term peace requires enhancing the humanity of ALL). Thus, maybe it isn’t so necessary for rung 3 to be written so strongly–since these points are already covered elsewhere. I think what rung 3 is really getting at is that there is value in realizing that good can exist on the other side and that there is value in seeking out this good. Thus, instead of saying there is good on my side and there is good on the other side, I’ll weaken it to say that good on my own side does not imply that there isn’t good on the other side. This doesn’t force that other good to exist, but reminds us that it COULD exist, and encourages us to at least search for the good. “That there are legitimately pros to my side and cons to my opponents’ side does NOT imply that there are no pros to my opponents’ side nor does it imply that there are no cons to my side–my opponents may indeed be CORRECT about the pros to their side and the cons to my side. This is really nice, and made me reassess how I think about some conflicts. However, sometimes there IS a right and wrong (classic examples: Hitler, serial killers), so the point about “People on the other side are right to feel the way they feel and right to think the things they think” doesn’t always apply. So how can we distinguish between times when both sides are wrong and this approach is valid (which I grant, is probably most conflicts), vs. times when there actually is a “good” and “bad”? It’s not always as clear cut as the 2 examples I gave above.